Blackwell Global is an STP-broker. It provides direct access to the market without using the Dealing Desk. It offers a wide range of trading instruments including more than 32 currency pairs, precious metals and CFDs. Blackwell Global is brand name of Blackwell Global Investments (Cyprus) Ltd that is regulated by the CySEC. Founded in 2010, it operates globally and has 8 introducing offices in Auckland, Beijing, Hong Kong, Lagos, Limassol, London, Melbourne, Shanghai and Singapore. Blackwell Global Investments (UK) Ltd., the broker’s subsidiary company, has a license issued by the FCA in February 2016 so it is eligible to operate in the UK. Both the CySEC and the FCA apply certain requirements to providers of financial services in Cyprus and the UK correspondingly. Thus, they set the minimum capital requirement which stipulates that the British brokers must have at least 730,000 euros on their accounts while the capital of the Cypriot brokers must be no less than 1,000,000 euros. The regulation by the FCA ensures safety of clients’ funds under the compensation program according to which 50,000 pounds per person may be paid out if the broker goes bankrupt. All brokers that are regulated by the CySEC also participate in the compensation program and pay out up to 20,000 euros per person in case of bankruptcy. Additionally, Blackwell Global obtained a license from the Securities and Futures Commission (SFC) of Hong Kong in 2017. Various account types differ by minimum deposit requirements and the size of leverage. Holders of standard and institutional accounts have access to Trading Central while those traders who register institutional accounts can use services of the company’s market strategist. Besides, the broker provides Islamic accounts which charge no swaps. The minimum deposit at Blackwell Global is $500. It is a rather high enter threshold as some other brokers require a minimum deposit of just $1. The spreads and commissions are average comparing to other brokers. Blackwell Global charges a spread of 1.6 points on EUR/USD. The maximum leverage is 1:200 which is a standard size for most brokers. However, some brokers provide a leverage of 1:1,000. Trading at Blackwell Global is conducted through the tried and true MetaTrader 4 platform. This platform features a wide range of charts, technical indicators, and expert advisors. Those clients who have several accounts can use the MT4 MultiTerminal (for clients from Cyprus) and Multi Account Manager (for clients from the UK). I've customized an Expert Advisor (EA) on the pro platform with Blackwell Global broker. My EA works well so far, as all orders executed by the STP, which has direct market access, so any orders always open or close on time, while their spread 1.6 pips are fixed on EUR/USD. So my profits reached $254K in a month. I have withdrawal my profile via PayPal, no problem yet. Actually, I've enjoyed the outstanding performance of forex trading with Blackwell Global broker. I have been trading with Blackwell Global for over 2 months I think they are the best broker. I have tried and tested my scalping EA's and EA works best with Blackwell. Slippage is also very rarer. I have experience just once with in 17 pips on GBP/USD but that was happened on high vitality market. Another thing I must say deposits and withdrawals through Neteller always processed quickly, my last withdrawal of $400 was processed within same day. I will rate them 4.5 out of 5. | enjoy trading with Blackwell Global. They have a live chat with very accommodating representatives. Also, they really respond immediately. It takes them only a few seconds. The platform is really stable and executes positions instantly. The prices are always according to the real market time. In my three years of trading with them, I didn't really have any major problem. I opened a standard account which requires a $10,000 minimum deposit and so far, I have already withdrawn a total of about $6000. Since I joined Blackwell Global in last October I have a positive experience with them. 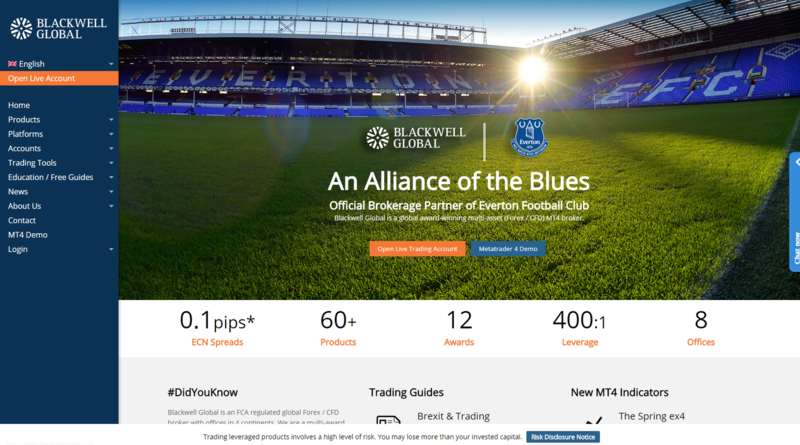 Blackwell Global is one of the broker that offer lowest spreads I have ever seen, fixed in 1 point that work on premium platform that easy to access and very friendly in desktop or mobile application. I used the Android MT4 installed on my mobile phone to access my trading account and of course to monitor the positions that I held, its smooth execution and I have never experienced problems. In my first and second trading, I only get 5% profit and even without bonus, but I think it's just a beginner so I make deposit and trading again and again. Now, my fund grows up to 30% from my deposit amount. Of course, I got some losses in trading, but their technical support help me solve and not do the same thing twice and until now I had many winning trades at this broker. For all theses reasons I recommend all of my friend to trading here. Blackwell is a reliable broker with professional support team. I have a standard account with them, trading on platform MetaTrader 4 for Desktop and Android. Both terminals work fast in execution with real time prices, and stability during volatility times. I trade 3 currency pairs with this broker EUR/USD, USD/CHF and USD/JPY. I had some opened positions during the night which because of the server I found out the next morning they were closed with a loss of 45$. Called their support team, I had my positions and money restored in about one hour. I recommend it. This broker has fulfilled all my expectations in my daily trading. The spreads they mention on their website is real, from 2 pips on EURUSD and other pairs, such as USDCAD and USDJPY. In my first week trading with them, I got $60. All went well as the trading session was very quiet with low volatility and stable servers. Even I could change the leverage in a few minutes after sending the request for it. The client area is very functional and I see all my trading history without problems. Finally, I received the money that I had been requesting since last week through Skrill. The money's worth $60.51 is credited to my account just this morning. I thought that I would never get my profit anymore because they didn't reply my letters anymore. :) Today, I want to try trading the precious trading metals such as Silver and Gold because the two have an affordable spreads. Will update my review next week.